« Leadership from the Front or Back of the Room? Today the Double Chooz collaboration presented our first results with about 100 days of single detector data at the LowNu11 conference at Seoul National University, South Korea. The presentation was given by our spokesperson, Herve de Kerret, and was such an exciting moment for our entire collaboration. A press release was submitted to interactions.org. 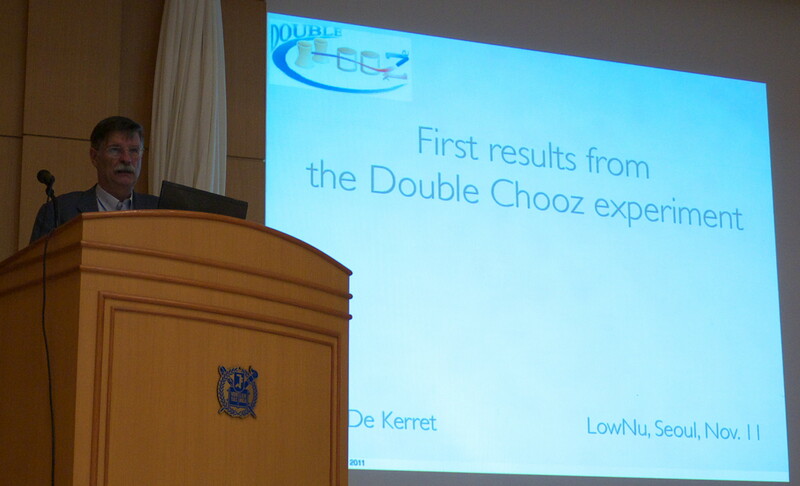 Spokesperson, Herve de Kerret, presenting "First results from the Double Chooz experiment." where we see that sin22θ13 sets the amplitude of the oscillation. As I stated before, our initial analysis was performed on about 100 days of far detector only data. 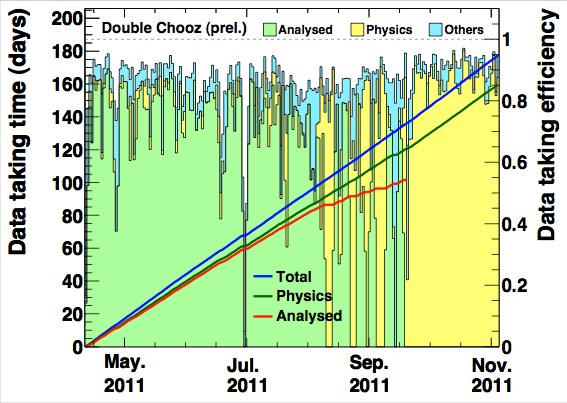 This graph shows both the data taking efficiency broken up into sub categories, and the total data taking time. During the August to September period, myself and others were on site to conduct the first radioactive source calibrations of the detector. The special data acquired during this time helped understand the detector response and was used to determine certain errors on our measurement. By combing though the data we can identify neutrino interactions by their unique signature. 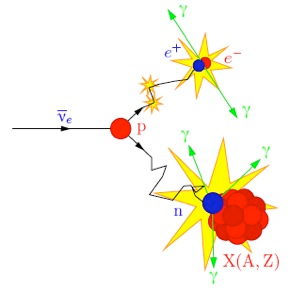 The detection reaction is called inverse beta decay, and results in the neutrino creating a positron (the anti-particle of the electron) and a neutron. The detector can measure the positron’s energy, and the energy released when the neutron captures on a Gadolinium nucleus inside the liquid scintillator. 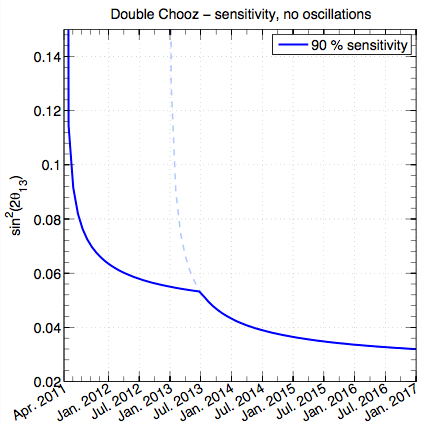 The double signal is beneficial for reducing random backgrounds since the mean time between the events is about 30 micro seconds. Counting up all of the candidate neutrino events, one can compare the number of detected neutrinos to the number expected based on the total power output of the nuclear power plant, information which is provided to us by the power company. 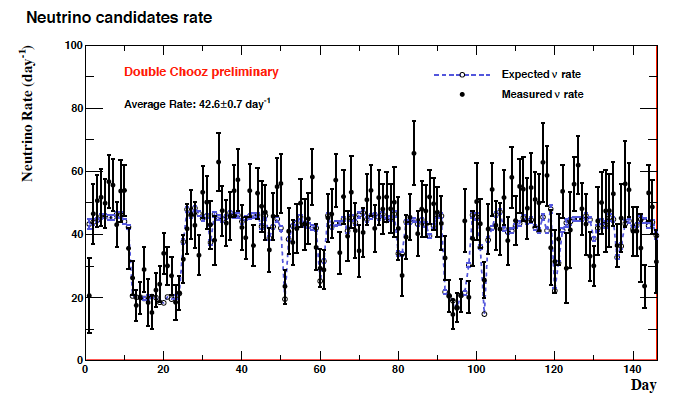 The following plot shows our detected neutrino rate per day along with the expected rate (blue dashed line), the average rate is 42.6 + 0.7 neutrinos per day. We see great evidence that our extracted neutrino candidates are in fact directly correlated to the reactor power, as they should be. As my first experience with preparing a physics result, the whole process has been enlightening. The fervor of our daily (and very early for California) meetings over the past few weeks has certainly demonstrated the deep passion of our collaborators to this experiment and this physics. 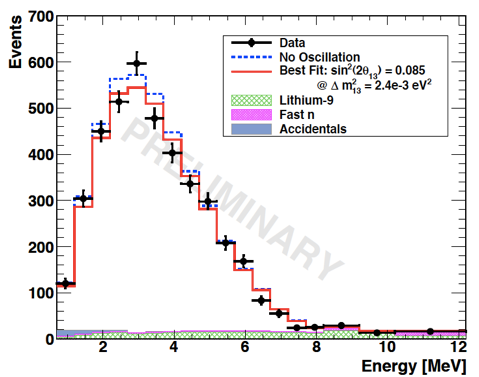 We look forward to more data and a better understanding of neutrino oscillations.